GALAPAGOS ISLANDS, Ecuador — It’s the biggest shark – and the biggest fish – in the sea, often found roaming in warm waters around the globe with its huge mouth agape in search of dinner. Yet despite its hulking appearance, the whale shark has only tiny, almost useless teeth and is sometimes so docile that entire boatloads of people can swim alongside the enigmatic, spotted beast. It’s also one of the least understood animals in the oceans. Marine biologists have been tagging whale sharks in recent years trying to answer questions about their life and reproductive cycles. Only one pregnant whale shark has ever been found: In 1995, a dead whale shark was found off the coast of Taiwan with 300 embryos inside, all at different stages of development. “The million-dollar questions are where are they mating, hunting and where do their young live?” said Jonathan Green, director of the Galapagos Whale Shark Project. 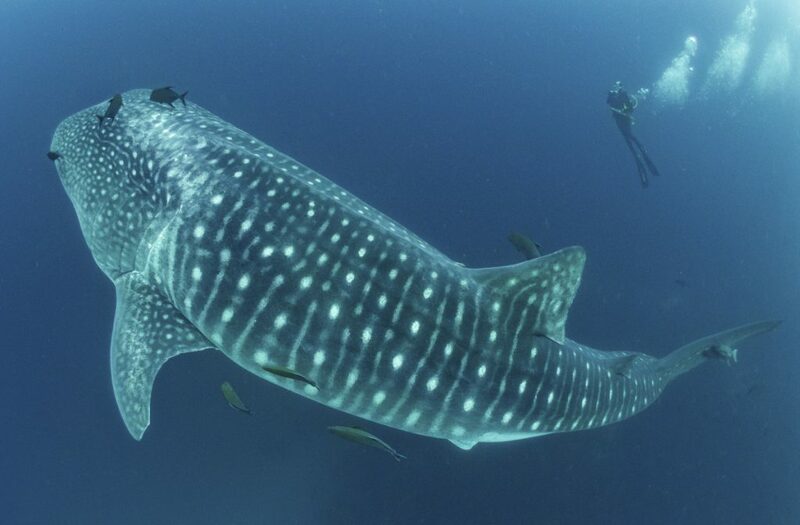 While they are comparable in size to whales, whale sharks are sharks. They typically grow to be bigger than a double-decker bus: between 20 to 52 feet and more than 20 tons. But as filter feeders, the enormous whale sharks are dangerous only to the plankton, fish eggs and tiny fish they chomp on. The gentle giants aren’t particularly fast compared to other sharks, but a simple wave of their tail propels them through the water faster than any human could ever swim. They have broad, flat heads and their entire dark-blue bodies are covered in dots that act as camouflage underwater. In the last 75 years, the vast majority of whale sharks have been hunted by people for food and their numbers are still dropping, said Simon Pierce, chief scientist at the Marine Megafauna Foundation. Some biologists worry climate change could hurt the sharks by reducing their food supply: rising ocean temperatures could mean less plankton. “If we do the things that are necessary to conserve the whale sharks, we’ll be conserving the ocean itself,” said Simon Thorrold of the Woods Hole Oceanographic Institute in Massachusetts.